It’s been a while to get on this blog but nice to be back here. I’m off again ready for another trip! My last proper trip was back in 2014 when I walked 1000km and cycled 1500km in Japan to think about and launch the concept of Teaspoons of Change. This trip is 1000km, 17 Global Goals, 2 people, 0 emissions and LOTS of Teaspoons of Change! See more details below and get in touch if we can swing past your town on the way or follow us online on the Teaspoons of Change Facebook page – https://www.facebook.com/teaspoonsofchange !!! I would have thought by now having done an accumulative period of around 12 weeks of Live Below the Line over the years I would be expecting it or used to it but this time, just like the rest, has me full of mercy, resolve and lover of life and humanity. Again for me it is the incredibly awe and appreciation of simplicity I get from Living Below the Line. It is a week where I eat better, walk more and have a greater appreciation of the simple and available things in like (obviously not being things!). 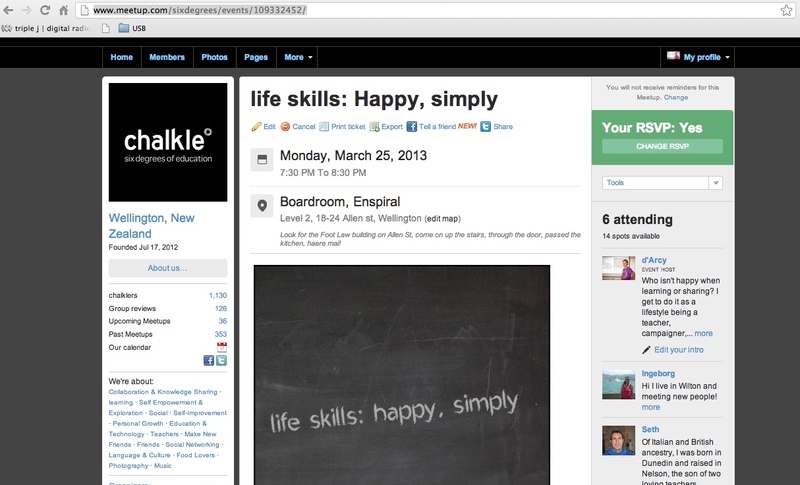 My 2013 LBL living has kicked off and this year with new and invigorated perspectives into simplicity and self-sufficiency! Live Below the Line is a campaign started by a couple of good friends of mine a few years ago to give people perspectives into the lives of people who live on less than what you can buy in the US for $1.25 or less / day (the World Bank definition for extreme poverty). Want inspiration, interaction, involvement, and insanely good calves? I will be running the cycle touring workshop in Wellington next Monday (25 March) and then again in Melbourne Monday 8 April. 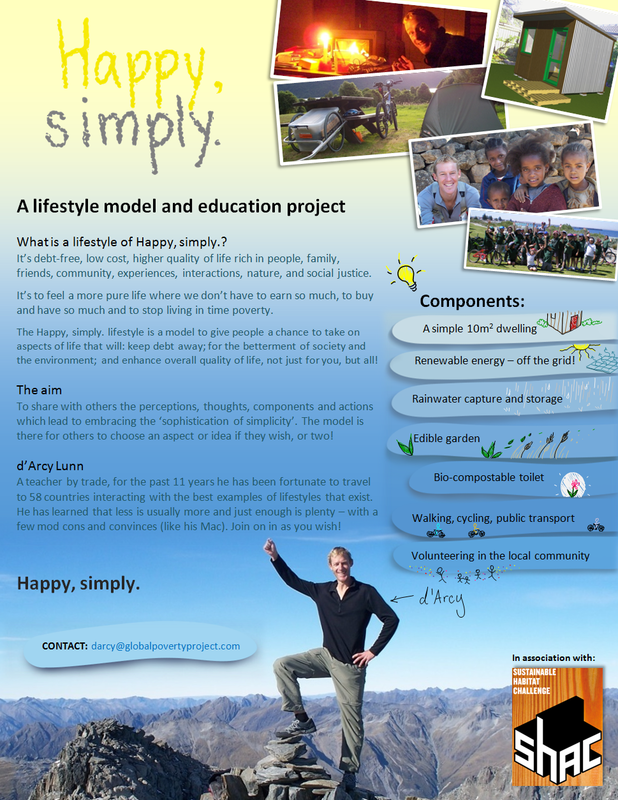 I’m also giving a workshop on my Happy, simply lifestyle model and education project on the same night from 7.30-8.30pm, if anyone is keen. I’m also giving a Happy, simply – lifestyle model and education project workshop there as well on the same night 6.15-7.30pm! Fri 6 Portland,OR Set up and Presentation opportunity! Sat 7 Portland,OR Presentation opportunity! Sun 8 Portland,OR Presentation opportunity! Mon 9 Portland,OR Presentation opportunity! 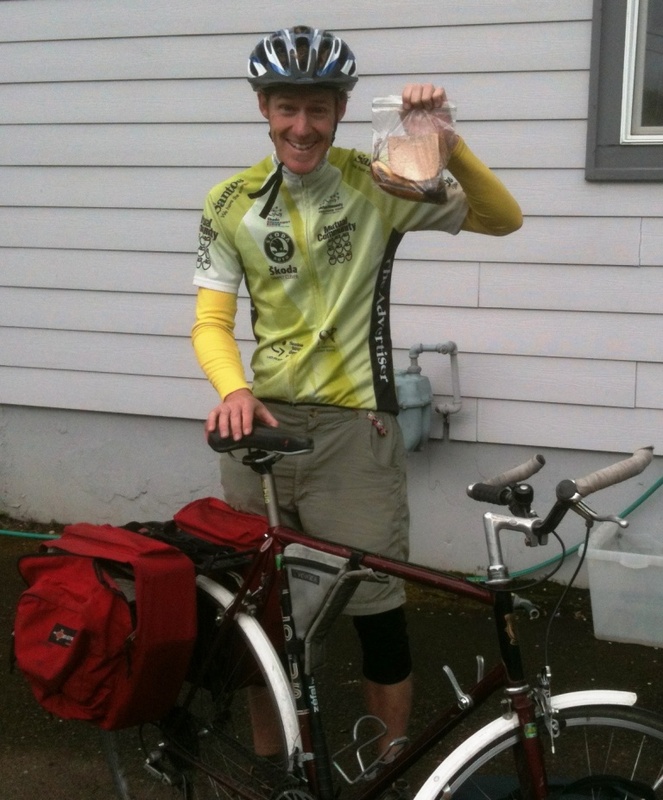 Tues 10 Kelso,WA Portland+ 90km →Kelso,WA via Longview City. Pres opportunity! Wed 11 Grand Mound, WA Kelso,WA+ 90km → Grand Mound, WA. Presentation opportunity! Thurs 12 Kamilche,WA Grand Mound + 55km →Kamilche,WA via Olympia Pres opportunity! Sun 15 Victoria,BC Ferry to Victoria. Presentation opportunity in evening inVictoria! Mon 16 Victoria,BC Presentation opportunity! Tues 17 Vancouver,BC Presentation opportunity! Victoria+ 35km to ferry from Swartz Bay and ferry. Tsawwassen + 55km toVancouver. Wed 18 Vancouver,BC Presentation opportunity! Thurs 19 Vancouver,BC Presentation opportunity! Fri 20 Squamish,BC Vancouver+ 70km → Squamish. Presentation opportunity! Sat 21 Whistler, BC Squamish + 60km → Whistler. Presentation opportunity! Sun 22 Whistler, BC Presentation opportunity! Mon 23 Whistler, BC Presentation opportunity! Tues 24 Squamish,BC Whistler + 60km → Squamish. Presentation opportunity! Wed 25 Vancouver,BC Squamish + 70km →Vancouver. Presentation opportunity! Thurs 26 Vancouver,BC Presentation opportunity! Fri 27 Vancouver,BC Presentation opportunity! Sat 28 Vancouver,BC Presentation opportunity! Sun 29 Bellingham,WA Vancouver+ 90km →Bellingham. Presentation opportunity! Mon 30 Arlington,WA Bellingham+ 85km →Arlington. Presentation opportunity! Tues 1 May Seattle,WA Arlington+ 95km →Seattle. Presentation opportunity! Wed 2 Seattle,WA Presentation opportunity! Thurs 3 Seattle,WA Presentation opportunity! Sat/Sun 5/6 Portland & beyond? Make way to Calgary, Chicago or New York? 7-11 May Live Below the Line Where best to be for week of Live Below the Line? I do have a backup to all of these and I’m very self-sufficient but all my trips are done as a full-time volunteer. I have been volunteering for the past seven months and will be for the rest of the year in various education and advocacy work so anything will be a bonus! Promise to return items as needed or replace, as hopefully not needed! Community groups and associations such as: schools, Rotary, environment groups, faith groups and even something like Scouts, fire-fighters, hospitals, councils and others! My global education journey started as a teacher in a remote Aboriginal school in the desert of South Australia. Since then I’ve spent the past 11 years teaching, volunteering and learning in over 50 countries. With these amazing rich learning experiences I mix information with inspiration and shared them with audiences in developed countries. Using my own personal stories and the Global Poverty Project’s 1.4 Billion Reasons interactive multimedia presentation we encourage people to go from knowing about the topics and issues on extreme poverty and the environment to taking action on them. I have been a key member of the Global Poverty Project since the first 1.4 Billion Reasons presentation on 4 July 2009 in Melbourne, have delivered over 100 GPP presentations and initiated and managed the youth and schools program in Australia. 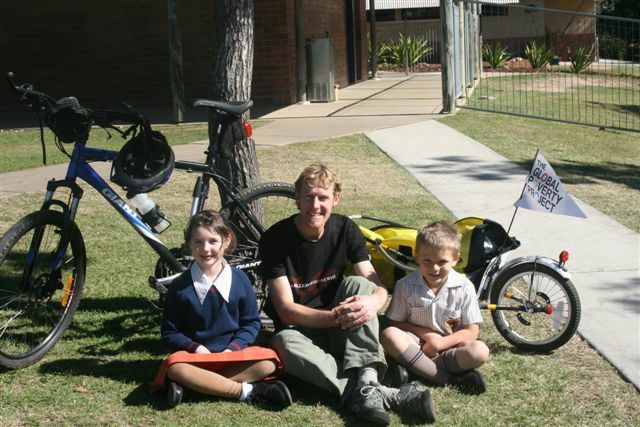 My previous presentation cycling trips include South Australia (2007), New Zealand (2009) and the East Coast of Australia (2009). Each with their unique blend of global and environmental awareness. I am extremely passionate and excited for my first presentation cycling tour in the US and Canadato give your youth and communities an opportunity to experience a GPP 1.4 Billion Reasons presentation, to promote the Live Below the Line campaign in May and showcase environmental awareness and healthy lifestyles. Our aim is not to fundraise or create resources, rather the Global Poverty Project seeks to inspire people to actively engage with the movement to end extreme poverty. The Global Poverty Project connects people with the organisations, initiatives, resources and actions that are already happening. The strength of the presentation is to provide context and catalyse comprehensive learning and engagement with global issues. Through our partnerships and working relationships we can connect audiences, teachers and leaders to organisations working specifically on a range of social justice issues. We connect you with learning guides, campaign actions, and a network of active citizens that can help facilitate a pathway of learning and engagement. My other focus will be to explain and inspire people to take on the Live Below the Line challenge of living on US$1.50 for food each day, for five days. Live Below the Line is a GPP initiative and was first run in North America last year. I will be doing the WHOLE cycle tour Living Below the Line. I hope to engage more people with this incredible campaign which will run again from May 7-11 this year. Will have a little more info like a timeline on having this happen but for now the POSTER!!! Got semi-regular blogs firing up on my other blog site around all things development, simplistic and strange… this one a transit day spent in Doha! Arriving at Doha, Qatar this morning at 6am I thought I would head out of the airport, go for a nice long walk and taste a bit of this Middle Eastern country and head back by night and on my way to Pakistan. Then about 30 minutes upon arrival I was told I couldn’t leave the airport (yuck – 17 hours in an airport!) or have to pay a huge amount to get a visa for the day and limited time to spend on the outside. That was until I spoke to someone who said – ‘oh you have a delay of more than 16 hours – they will put you up in a hotel, pay for visa and all meals’. Game on. And that is what happened with a long (very hot and burnt) walk.